Background: Gefitinib (lressa) is the most prescribed drug, highly effective to treat nonsmall cell lung cancer; primarily it was considered that targeted therapy is a kinase inhibitor. The nonsmall cell lung cancer is caused by mutation in the Epithelial Growth Factor Receptor (EGFR) gene. Iressa works by blocking the EGFR protein that helps the cancer cell growth. EGFR protein has lead to the development of anticancer therapeutics directed against EGFR inhibitor including Gefitinib for non-small cell lung cancer. Methods: To explore the interaction between Gefitinib and its derivatives with crystal structure of EGFR to understand the better molecular insights interaction strategies. Molecular modeling of ligands (Gefitinib and its derivatives) was carried out by Avogadro software till atomic angle stable confirmation was obtained. The partial charges for the ligands were assigned as per standard protocol for molecular docking. All docking simulations were performed with AutoDockVina. Virtual screening was carried out based on binding energy and hydrogen bonding affinity. Molecular dynamics (MD) and Simulation EGFR were done using GROMACS 5.1.1 software to explore the interaction stability in a cell. Results: The stable conformation for EGFR protein trajectories were captured at various time intervals 0-20ns. Few compounds screen based on high affinity as the inhibitor for EGFR may inhibit the cell cycle signaling in non-small cell lung cancer. 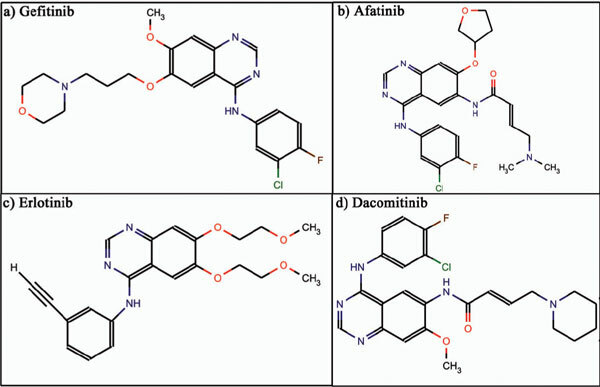 Conclusion: These result suggested a computer-aided screening approach of Gefitinib derivatives with regard to their binding to EGFR for identifying novel drugs for the treatment of non-small cell lung cancer. Non-small cell lung cancer, EGFR, gefitinib, molecular docking, molecular dynamics, avogadro software.